The distinguishable voice of Rod Sterling has sent shivers down my spine since the day I watched my first episode of The Twilight Zone. The show terrifies and fascinates me in a twisted way. And to this day, entering the said Twilight Zone tops my list of things I am most afraid of. Why? Because it is psychological torture! The lines that separates reality and make believe is blurred and we are confronted with our worse fears. When I opened The Underwater Welder by Jeff Lemire I was struck with giddy horror to discover I was about to read an episode of my favorite show that had never been produced. The introduction touches on the sections of the story that are motifs within the beloved show of the 60s. Damon Lindelof lists the strange and creepy, flawed yet realistic characters, and a lesson of morality. 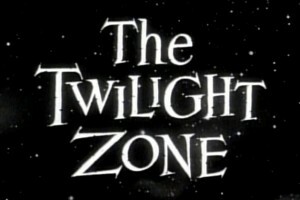 One reoccurring theme used in many Twilight Zone episodes that is shared by The Underwater Welder is a abstract, non-linear time line. While the fifth dimension is never mentioned in the story, you could say our protagonist, Jack, enters it when he dives back down to the bottom of the ocean to collect the lost watch, given to him by his deceased father. While the story never explicitly shows us the fathers death, it is implied he drowned trying to recover the watch after Jack throw it into the ocean out of rage and disappointment in his father. This event had haunted Jack ever since. When Jack resurfaces to his home of Tigg’s Bay, the town seems abandoned. However, it is not as though Jack has resurfaced into another time completely. When he goes to his house, the puddle from his wife Susan’s water breaking still is wet on the floor. Yet, Jack’s own body seems to continue “moving forward” since he begins to grow facial hair. Even more haunting, Jack beings to hear his unborn baby crying and relives memories of his childhood centered around his father. At one point, Jack jumps into a car and tries to escape his prison, but is unable to leave the town. He continuously passes the “Now leaving Tigg’s Bay” sign time and time again. All these eerie occurrences still embody the classic Twilight Zone spook. This suspended time frame allows characters to reflect on the flaw that caused them to stumble into the Twilight Zone in the first place. For Jack, he could not look past the mistakes his father made which caused him to begin making the same mistakes. What makes this story unique to the medium of comics and graphic novels, is the use of artistic style that indicates where the lines of reality cross. 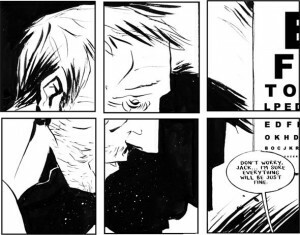 Lemire uses water colors to paint scenes underwater and within the “Twilight Zone.” If you want to look at this outside of the context of the show, the depictions of what Jack sees when he passes out underwater are drawn in the same style as scenes at the bottom of the ocean. To me, this can become very symbolic. If what Jack sees is all in his head, we can run parallels between the ocean and the vast abyss of the human mind. Not just the ocean, but what lies beneath is dark, ominous, and unfamiliar. The unconscious mind can take us to place that are equally frightening, and that is what happens to Jack. When reading The Underwater Welder, the intro stuck out to be about the reference to The Twilight Zone, watching parts of it not only creeped me out too but I became terrified. Although this graphic novel is very different, there still is that question of reality from past to present. It is interesting to see how Lemire chose to illustrate this idea in comparison to Asterios Polyp and Swallow Me Whole.